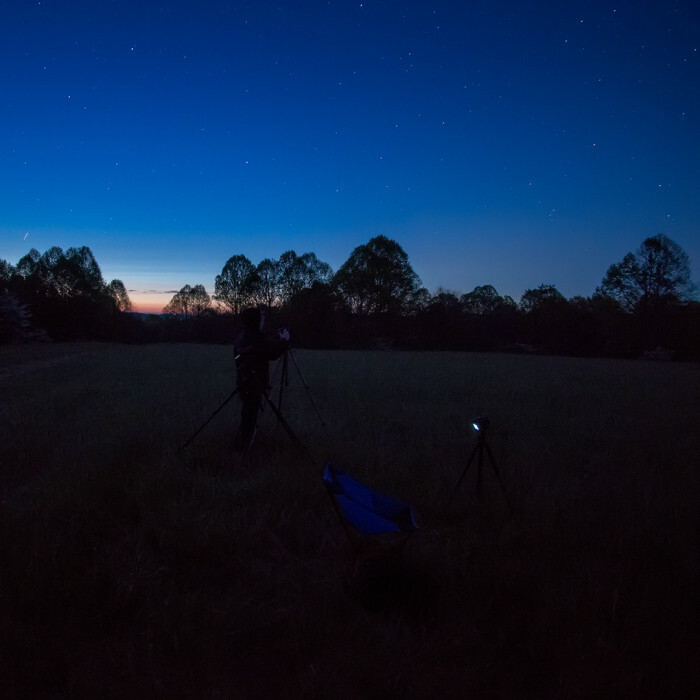 May in Ohio is a mixed bag for astrophotography. Temperatures very close to dew point make condensation a concern and the Milky Way rises at about 2:00 to 2:30 AM. Do you stay up all night or get up really, really early? On the plus side, there are very few airplanes in the sky at that time of the morning. 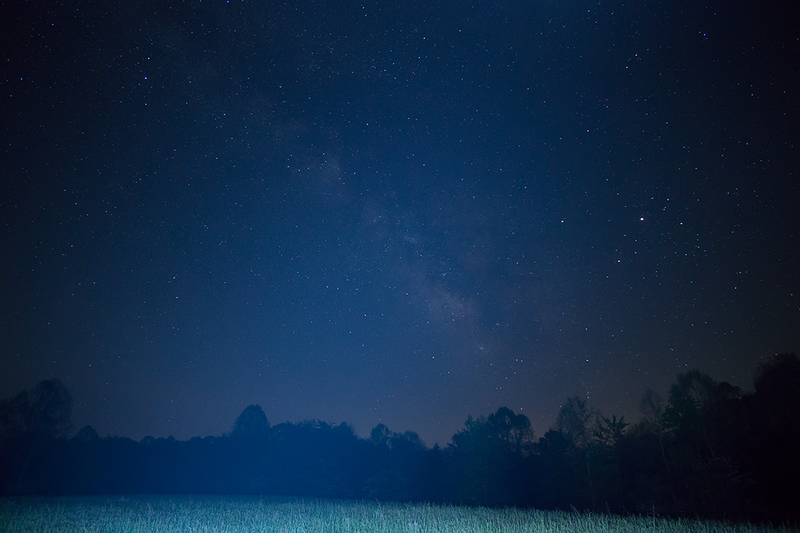 Recently we had clear skies on the night of the new moon so I got up at 1:30AM to drive down to Hocking Hills, meet another photographer, and to try out a new location and a new filter. Not far from Cedar Falls in Hocking Hills State Park Park, there is an open field on a south facing ridge. It offers a fantastic 180 degree view of the southern sky. After meeting @aaronrichard, we drove to the parking area and trekked up the steep hill in the dark. I had scouted the trail a few days before and there were blazes on the trees so it wasn’t too difficult to get to the clearing. After picking a spot, we setup and started shooting. After fine tuning focus and composition, I tried out a new filter: a Hoya “Red Intensifier” and was amazed at the results! 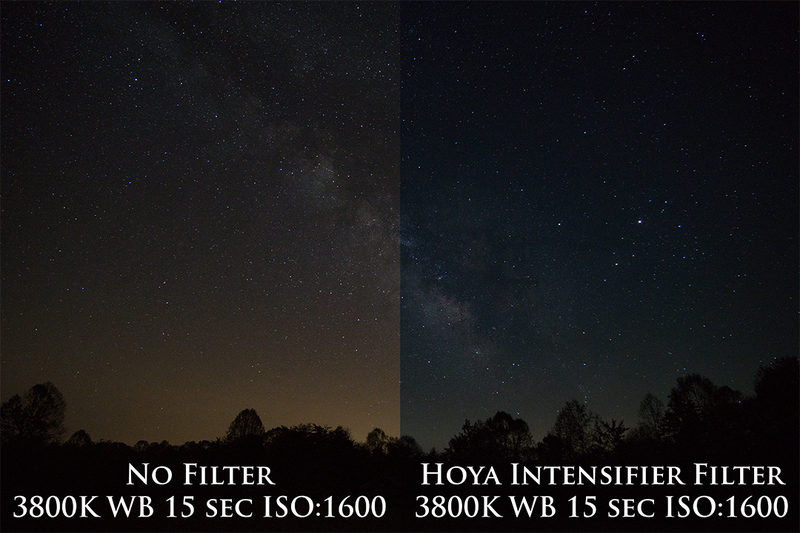 Not only does the filter drastically reduce the orange glow, but it also makes more stars visible near the horizon. 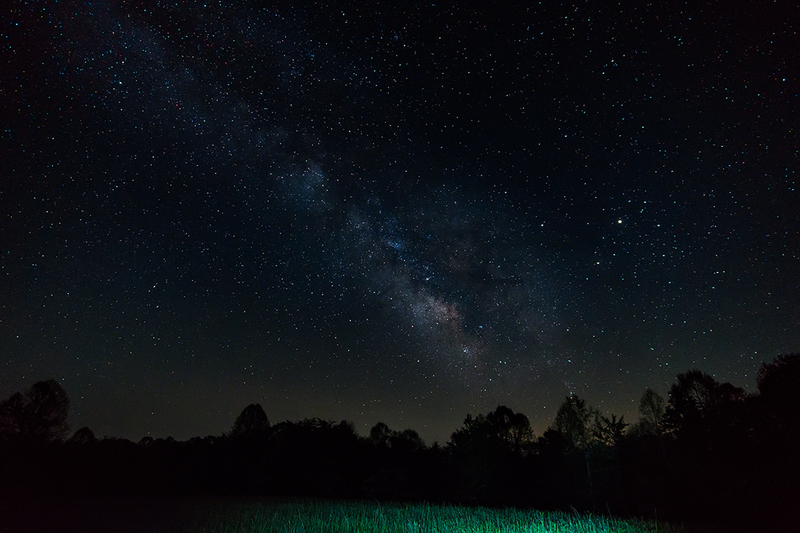 To make the foreground more than a black silhouette, I tried adding a little light painting. First I tried the variable 600 lumen 160 bulb LED light but light intensity falls off exponentially. It over exposed the immediate foreground but it wasn’t strong enough to reach the trees. I think next time I’ll try positioning it out of frame and closer to the trees and just leaving it on. Next I tried light painting with a 1000 lumen LED flashlight. The light could reach the trees, but it’s so bright that it lit up the humidity in the air right in front of the camera. Again, positioning it closer to the trees and off to one side may give me better results. Finally I decided to do two exposures and composite them together in post. 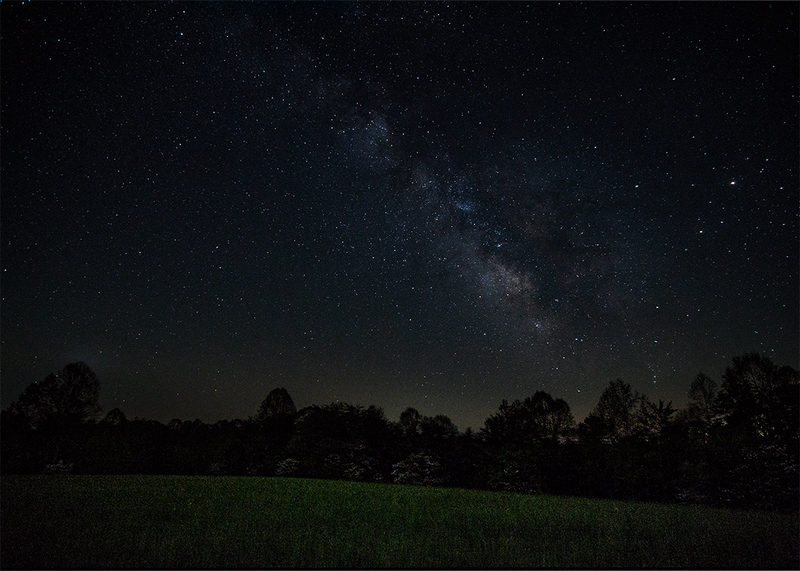 The first exposure for the stars was taken at ISO:1600 f/2 12mm and 15 seconds. 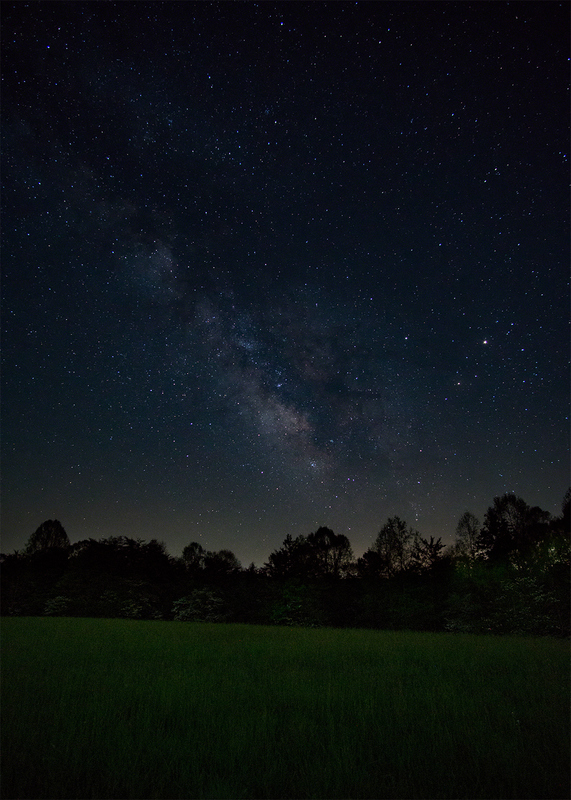 The second, for the foreground, was taken at ISO:1600 f/2 12mm and 82 seconds. 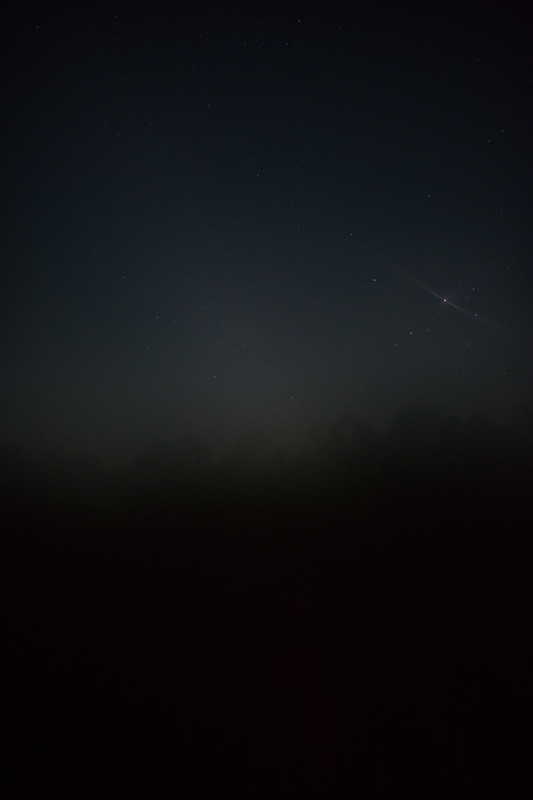 There was no added light, just the ambient star light lit the trees and grass. I setup my second camera to do a time lapse but the results weren’t very good. About 90 minutes before sunrise, condensation became a real problem. I’m still searching for the best way to deal with condensation on a lens. I’ve tried hand warmers and I’m hoping there’s a better solution. As the sun started to rise and the stars started to fade, Aaron and I packed up and headed to Corkscrew Falls… but that’s another post.